The Gray Report: My Month of Malbec, the diary, part II: Antarctica ho! My Month of Malbec, the diary, part II: Antarctica ho! I spent most of December in Argentina and Antarctica on vacation, and kept a wine diary. This is part II, and a great excuse for me to run some Antarctica photos. Part I is here. Despite my happy experience with $3 Etchart Privado Torrontés, I don't set out to buy only cheap wines to take to Antarctica. It just ends up that way. This is how I end up with 7 wines for $58. I don't mind splurging on wine; liking cheaper wines more than expensive ones is nearly unique to Argentina and Malbec for me. This plays into my preference for lower-alcohol wines, because in every single case when I have a choice to make in my whirlwind shopping trip in the southernmost city in the world, the wine lowest in alcohol is also cheapest. Fact: In Argentina, the alcohol level on the label is more accurate than in the U.S. because it is stamped on most wines, rather than being part of the label itself. Not only that, Argentina's wine law allows only a 0.5% tolerance for error, compared to up to 1.5% in the U.S. There are only two places to buy wine in Ushuaia. So I go back to the Wine Shop at the End of the World and a different guy is working. Whew! He understands what I want, though he doesn't approve. "Most Argentinian wine is full-bodied," he says. "That's what most people like." He says I should buy Pinot Noir from Patagonia. While I decide between two, he shows me a Malbec under 14% alcohol. The back label speaks to me with its precise description of winemaking methods. It is the cheapest of three made by that producer, and the lowest in alcohol. How can I turn it down? After a trip to the grocery store here's my final lineup for Antarctica, with a quick note on exchange rates: the official exchange rate is under 10 pesos to $1. The unofficial "blue rate" we get from moneychangers varies from 13.5 to 14.3. I have used an exchange rate of 12. Why that matters: most wines I bought were about 100 pesos, which seems to be a key spot the way $10 is in the U.S., but I have listed them at $8. Searching for a USB connection, I find an electronics shop that doesn't have the cord I need, but does have suspicious gray-market liquor. The wines I bought legally all have a sticker in Spanish saying they may only be consumed in Tierra del Fuego and the islands of the South Atlantic. This means I will break Argentine law by drinking them on the Antarctic Peninsula, but I'll be outside Argentina's jurisdiction and what are they going to do, pretend our ship is a British frigate and attack it? None of the booze in the electronics shop has this sticker. Fernet Branca, which tastes like medicine because that's what it was originally created to be, is popular in two places in the world: San Francisco and Argentina. San Francisco restaurant workers like it after work; it's easier than brushing one's teeth at a bar and delivers 40% alcohol. In Argentina they drink it mixed with Coke. Even the tiniest bed-and-breakfast has a bottle of Fernet Branca from which they'll sell you a drink. I decide Fernet is a more Argentine experience than Scotch, and with the rough Drake Passage looming, I'll see if, as advertised, it really does settle the stomach. Problem is, I don't really like Fernet Branca. I can grimace and take it and I don't mind the aftertaste, but it's not my idea of a treat. Argentines like it so much that there are copycat brands. Rarely in the U.S. do you ever see any other kind of Fernet, so most people probably think Fernet is a brand, but it's a strong type of Amaro. Banfi just started selling one in the U.S. called Fernet Florio that I really like -- it's gentler and more complex -- but the electronics shop doesn't have it. They do have three other non-FB brands. I hem and haw and pick up a bottle of Cinzano Fernet, figuring I like Cinzano's vermouth well enough. The shop clerk vigorously tries to talk me out of it. "This is the good one," he says, holding up a bottle of Fernet Branca. "That's not the real thing." I tell him I know what Fernet Branca tastes like, and just want to try something different, and how much is it? Turns out it's just $3.30 US, while Fernet Branca is $10 -- super cheap by U.S. standards. As with the wines, I'm not really buying the cheaper thing because it's cheaper, but it doesn't hurt. "But this is the good one," he says, making one, and then another, attempt to talk me out of wasting $3.30. I don't believe he's upselling me; he just seems passionately against me buying his cut-rate off-brand gray-market Fernet. On the ship, I never interest anyone in trying it. Ian the bartender doesn't like Fernet Branca and doesn't even want to smell my cutrate offbrand Fernet from the electronics shop, though he does cheerfully give me 1000-year-old glacier ice that he had whisked out of the sea, just as I'd hoped. I like it. It's milder than Fernet Branca and good on the rocks as a digestif, which is how I like to drink Fernet. From now on I will do more liquor shopping in shady electronics shops. Night 6: Not the cheapest wine! With our final meal on shore at Kalma, we have terrific paella packed with shellfish, king crab and fresh fish from the chilly Atlantic Ocean, I want Torrontés. The list has three, and this time the cheapest is not the lowest in alcohol. I splurge $22 for Zuccardi Serie A Torrontés (14% alcohol) and it's good: balanced, with an elegant mouthfeel, though I cannot say I like it better than the $3 supermarket Torrontés. This is good, because I have the latter for the ship and don't expect to see the Zuccardi again. There's no need for extensive tasting notes from my wine stash. Nothing bores me more than a list of fruit flavors with only slight variations (this one is more cherry than raspberry). The only real question is, with 7 wines for $58 in the south end of the planet, how good are they? The answer is, they range from OK to quite good. The Bonardas are best; cheerful, fresh and fruity. 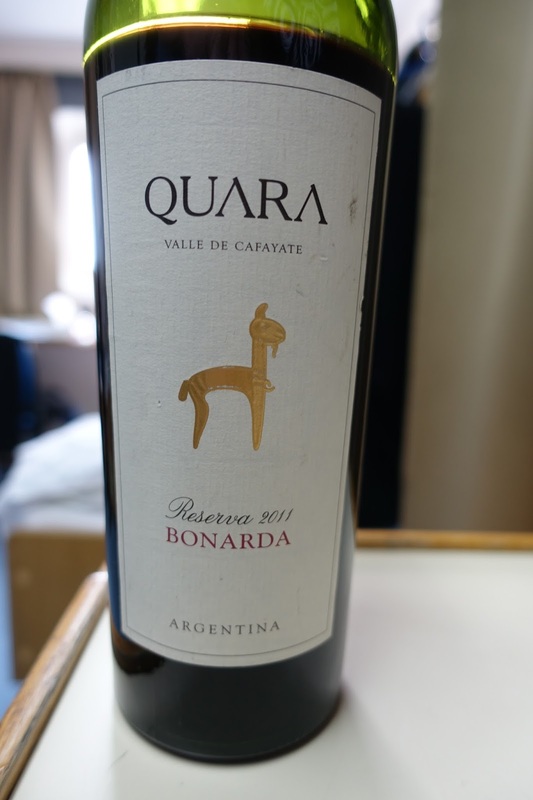 Moreover, they are a little older than the other wines, probably because Bonarda sits on the shelves, so the Quara in particular has some nice complexity from secondary characteristics (sorry, apparently this is not available in the U.S.). The passengers I share them with love them, more even than me, which is a reminder about how jaded wine geeks can get about supermarket wines. The Pinot Noir is underwhelming without food but serviceable with dinner, and what more can one ask from an $8 Pinot? I drink the Newen Torrontés over the first two days, while we are cautiously avoiding the seasickness that fells a high percentage of our shipmates. It's fine; a little more herbal than the Etchart, possibly because it may be completely dry. It's Torrontés reminiscent of Sauvignon Blanc, whereas the Etchart is Torrontés styled like Riesling. I truly enjoyed both and paid $11 for the pair. I save the Malbec almost for last, until we get rack of lamb. The people at my table are more excited about it than any of the other wines because they know what it is. A number of passengers hoping to get a glass tell me how much they like Malbec. For me, well, it's OK. It's firmer in texture than the Bonardas and we have been taught to experience that as a positive quality. I am glad My Month of Malbec includes a Malbec. I could have bought my wines in San Francisco. I would have spent $300 for 7 bottles for a special journey like this, because I would have included a couple splurges. But there are weight limits on the flight from Buenos Aires to Ushuaia. And I drink fabulous wines in San Francisco all the time. It was interesting to make do with what I could scrounge at the end of the world. In the polar region, it felt exploratory. When I run out of wine, I buy one from the ship's list, which it turns out is not overpriced. It's Domaine Monternot "Les Jumeaux" Beaujolais Villages 2011 for $20. It's delicious, fruit-driven with good smooth texture. I'm happy to have it, but also glad that I don't have an "Ahhh! Back to France" overreaction. I can drink Argentine wine for another week, no problem. But how much will be Malbec? I buried the lead a little: Antarctica is beautiful. Breathtaking. Not as cold as you think in summer (about 0 Celsius every day, give or take a couple degrees), and visually stunning every day. The penguins don't seem to care that you're there; they just go about their business. It was hard to choose photos for this post because I have so many beautiful ones, even though it's hard for the camera to capture the soft blue glow of glaciers in overcast conditions. In Antarctica, there's no wifi, no phone service, and my favorite moments were when I put down the camera and just watched the ice and listened to the quiet. Land ho: White wine with crab? Really? Ushuaia is famous for king crab. Tourist restaurants have tanks where crabs spend their last few hours being ogled by passersby. You buy a whole crab -- ours weighed 1.8 kg and cost $70 US, which is a fortune in Argentina -- and they grill it and present it simply with mayo on the side, and heavy duty scissors to cut open the legs. We sit with some Singaporean friends from the ship. 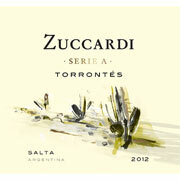 I order a Torrontés, the Zuccardi Serie A again. Normally I like to drink something different every night but Ushuaia seems to have only one wine distributor. I later look up the wine online and discover it's saddled with an 84 from Wine Spectator. Of 412 Argentine wines reviewed in its most recent look at the country, the Spectator gave lower scores to only 20. Decanter gave Zuccardi Serie A Torrontés a World Wine Award but the Spectator considers it one of the worst 5% of wines in the country. So naturally I have it twice and share it with friends, because Wine Spectator is partly responsible for the all-power, all-oak focus that has made so many Argentine wines so one-dimensional. My friend Miaw is astounded that I want white wine with crab and paella and shellfish. I am unusual in the restaurant (Le Fuegino de Freddy): most people have beer or Malbec with crab. Miaw says she doesn't usually drink white wine. Nor does she drink much wine at all. This may have been a life-changing meal for her. Between her, myself, and my wife, who really doesn't drink much, we easily polish off two bottles, the Torrontés and a Luigi Bosca Sauvignon Blanc (also very nice). Even if I drank an entire bottle by myself, which is possible, that's a lot of white wine for Miaw, who is tiny. She is enthusiastic by the end of the evening. A white-wine convert! She's off to a 12-hour bus ride towards Patagonia at 5 a.m. so I hope she drinks lots of water before bed or she may have the mother of all hangovers. The people at the next table ask why we drink white wine with crab. I tell them it's good and offer them a taste. They decline, pointing at the half-empty bottle of red in front of them. "We have Malbec," he says. Next internet meme: "We have Malbec." This was "then" (circa 2011) . . .
Study of 129,000 wines reveals some vintners deliberately -- but legally -- market wine as less alcoholic than it is." "The American Association of Wine Economists found that 57% of the wines analysed were stronger than declared on the label. The average alcohol content was 13.6% when the average reported strength was 13.1% according to the biggest study of its kind undertaken yet. It was based on imports into Ontario, Canada, one of the few places to test the alcohol content of every incoming wine. Bottles from Chile, ARGENTINA and the US were the worst offenders overall, but all of the wine-making countries analysed, including France, Italy and Spain, on average underplayed alcoholic power." ". . . Kate Fuller, who teaches agricultural economics at Montana State University. ... along with a team of researchers that included Julian Alston, a professor in the Department of Agricultural and Resource Economics of the University of California at Davis, and James Lapsley, a retired professor who has written and researched extensively about wine, set out to test two theories. The first was something experts have been warning about for some time: Wines, for various reasons, have been getting more alcoholic. The second was something else: Winemakers have been inaccurately reporting the alcoholic contents of their wines. "The team dusted off data from the Liquor Control Board of Ontario, which oversees and tests all wine imported for sale in Ontario, Canada. The sample included more than 127,000 wines (roughly 80,000 of them red, 47,000 of them white) imported over the eighteen years between 1992 and 2009. And it told an interesting tale. "... The analysis uncovered a sizable discrepancy between the alcohol content reported on bottles and the actual alcohol amount observed during testing, largely due to systemic underreporting. "It's legal. In the United States, wines with 14 percent alcohol by volume or less are allowed to have a range of 1.5 percentage points from the amount stated on the bottle. In Australia and New Zealand, it's 1.5 percentage points, too. And in Europe, the permitted range is half a percentage point, which is about as stringent as it gets. "On average, wines around the world tended to understate the alcohol percentage by volume by 0.15 percentage points. New World wines (red and whites from the United States, South America, Australia, etc. ), underreported by closer to 0.2 percentage points on average, while Old World Wines (largely those from Europe) tended to understate it by just over 0.1 percentage points. The wines from Chile, ARGENTINA, the United States and Spain, meanwhile, which underreported alcohol content by 0.27, 0.24, 0.23, and 0.21 percentage points respectively, carried the least accurate labels."